You got my curiosity up and I went googling. Would love to visit that one. I dont know, it doesn't look like a Sharon Kay Penman cover to me. Its nice enough though. There hasn't been an SKP historical fiction novel that I haven't liked! I have not tried her historical mysteries, though. The Wales Trilogy were the most moving novels that I have ever read (actually brought me to tears in a couple of different places). After reading these novels, I fell in love with Wales and am trying to plan a trip to visit some of the places in her novels as well as to see as much of the country as possible (I know it is part of Great Britain but seems to be a place of its own). Has anyone been to Wales? Just a very short trip a few years back to Caerphilly Castle. We switched trains at Cardiff but didn't have a chance to look around the city. I think we have forum members that live in Wales or are close to there. I've often holidayed in North Wales and Anglesey, across the Menai Straits. My brother's in-laws live on Anglesey. I've also been to Pembrokeshire and South Wales. The Welsh language and speakers of such have a greater strength in the North. A lot of the population of South Wales don't speak Welsh. My younger son was at the University of Aberystwyth, so a couple of years ago we were toing and froing across the centre of Wales every few months. Basically get to Shrewsbury. turn left and keep going west until you reach the sea! The scenery is fabulous. It has a tendency to rain quite a lot though I've been to most of the castles at some point or another and all have their particular glories. If I had to pick one, it would actually be South Welsh - Manorbier and where Gerald of Wales was born. It's right on the beach and you can actually stay there self catering if you have the money! http://www.forgottenhouses.co.uk/html/h ... rbier.html We didn't; we were just day visitors, but very impressed by the haunting music coming from hidden speakers in some parts of the ruins. It has a beautiful rustic garden too. South Wales isn't so much on the beaten track for SKP's Welsh trilogy which tends to concentrate more on the north though - but it's all beautiful and Snowdonia is majestic. I've been to the Dolocauthi gold mines too! 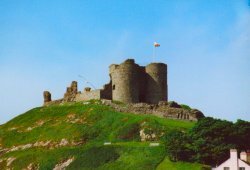 You can find out about what to see that SKP might have mentioned in her books--most of the best-preserved castles that a tourist might see were built by Edward I as part of his conquest of Wales after 1282. To find the Wales of the Welsh Princes, you have to venture a bit more off the beaten path. Last edited by Ash on Sat April 4th, 2009, 3:00 am, edited 1 time in total. Will have to read it when I get the third book. Looks most interesting.